Documentary ambitions and unstoppable curiosity have given student filmmaker Shawheen Keyani a head start in capturing his subjects. Currently studying photography with the Art Department's Lewis Watts, as well as documentary filmmaking and printmaking, Keyani admits he is enamoured of "observational documentary—an artistic process that speaks for itself." Keyani uses a Canon 60D DSLR —"it's primarily for photography, but is now being used for filmmaking," he explains. The camera offers multiple lens capability, "which gives filmmakers the opportunity to create professional films. Not only can I switch lenses, but this allows me to experiment with various depths of field." Keyani already has several filmmaking credits under his undergraduate belt. "I created an "observational" personal film, plus I have a documentary film project in progress. And I did the Kresge Garden documentary, using stop motion titles. Both of these documentary projects got positive attention from the film department." Keyani's plate just became fuller, since he's not only a film and art double major, but he's recently added electronic music to his coursework. "I'm likely to be at work either in The Cellar printing, or in the electronic music studio." Of his visual and musical interests, Keyani admits "they will eventually merge." Born in Newport Beach of Iranian parents, Keyani grew up in Tehran. "I was a city kid in Tehran until the age of fifteen, when I came to Ojai to go to boarding school." 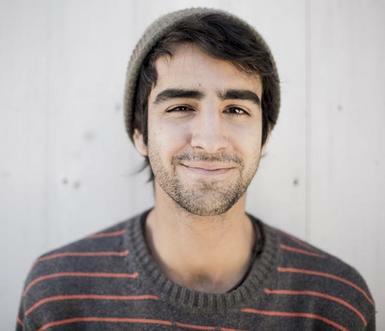 During his senior year, Keyani took time to visit San Francisco where he created a final project, a documentary about skateboarding in the Bay Area. "It was about 20 minutes long, and it put me in a confident place," the young filmmaker admits. He brought that confidence, "and a lot of craft" to UCSC. "I've found that you really have to be self-motivated. For example the Cellar is a beautiful facility, and if you're motivated, you have all this great equipment that you can use. That's how life works." "I've recently moved into the trailer park here on campus," Keyani notes enthusiastically. "It gives me the opportunity to have a year-round home." Taking his role as a "global citizen" seriously, the Arts undergraduate has already made ambitious plans for his future. "I was in India this winter break with a friend of mine, and I made photos of Mumbai, where there is a fascinating juxtaposition of timeless Eastern culture and new, changing Westernized culture." Keyani found himself captivated with India's old/modern cultural blend, captured in shots such as his photo "of a lady and her cow standing next to a skyscraper." The cache of images from India are still waiting for their ultimate shape. "I'm still trying to figure out what to do with them." But meanwhile he's busy working on film projects for the Arts Division. "I did a three minutes film for the Art Department." In this piece Keyani says that he wanted to capture the process—in this case of a typical day of student work in the print studio—"I wanted to capture specific arts in process, and reveal why that is important today." "If a prospective student sees this film I did for the art department, who knows? they might want to come here and make art too!"